Stats taken from the back of the Kenny Powers baseball cards. You can also view stats by team / season below, with pitch velocity, a short summary, and off-color comments made in all cities. 2006 SEA ? ? ? ? ? ? ? ? ? ? As a rookie Kenny got the final out of the 2002 World Series (2-out bases loaded K). Now famous, he was “given the keys to the kingdom”, but decided to file for free agency in an ego-fueled press conference. 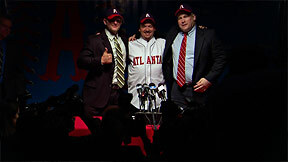 Kenny signed his first free agent contract with the New York Yankees. Velocity was down a bit, and he immediately offended the city in one of his first interviews when asked how he felt about playing for New York. Less of a fastball, and once again on to another new city. Did he have a recliner next to Barry Bonds??? 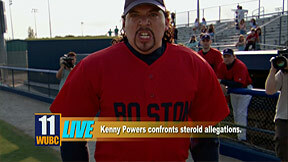 His third team in as many years... With his velocity dropping even more, Kenny allegedly turned to steroids. Soon he was caught up in the steroid controversy that would eventually sweep baseball. 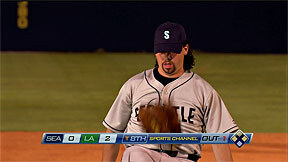 By now his fastball is in the tank, and it looks like he spends too much time partying like Darryl Strawberry... He gives up a grand slam to his nemesis, Reg Mackworthy, and that does it for his career.